I am sitting here this morning thinking about the passage in I Corinthians that I will be preaching tomorrow morning. The last phrase we will see before the invitation is "Charity (love) never faileth". It is like the Lord is saying that the validity of all he has taught us about loving people for the last several verses should be our goal because of the nobility and eternality of love. So, what does that mean? 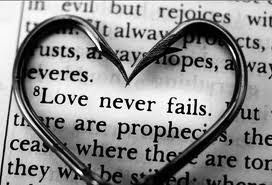 "love never fails?" If you keep reading it becomes clear that many of the things that we think are tremendous spiritual virtues and abilities (prophecy,tongues, knowledge) will be gone at some point in history. Those supernatural revelations will be no more - but love "lasts". It will be a high and noble virtue supported by the Lord on through all of eternity. I think about that in my love to people. For instance, in my love to my children, some of the things that cause friction between us and I make a big deal of simply will not last. I allow things like their lack of performance in school, chores, etc. to interrupt the fellowship of my love to them when the truth is whether they earned a "B" or a "C" in Chemistry is not going to matter in the grander scheme of things that really matter. Love does matter. Love lasts. We certainly must push our kids, but not to the point of causing anger and deep scars from our words and scoldings. We have but a few fleeting years with friends, family, coworkers, spouses, etc. We need to concentrate our relationships with others on what matters: Love. Love lasts and so we must make it the highest priority with others right now.